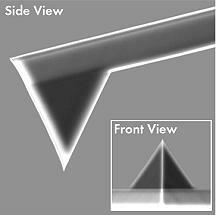 NanoWorld Arrow™ NCPt AFM probes are designed for non-contact or tapping mode imaging. This probe type combines high operation stability with outstanding sensitivity and fast scanning ability. All SPM and AFM probes of the Arrow™ series are made from monolithic silicon which is highly doped to dissipate static charge. They are chemically inert and offer a high mechanical Q-factor for high sensitivity. These probes feature a rectangular cantilever with a triangular free end and a tetrahedral tip with a typical height of 10 - 15 µm. Additionally, this AFM tip offers a tip radius of curvature of less than 25 nm. The unique Arrow™ shape with the tip position at the very end of the cantilever allows easy positioning of the tip on the area of interest. A trapezoidal cross section of the cantilever and therefore 30% wider (e.g. NCH) cantilever detector side result in easier and faster laser adjustment. Additionally, because there is simply more space to place and reflect the laser beam, a higher SUM signal is reached. The PtIr5 coating consists of a 23 nm thick platinum iridium5 layer deposited on both sides of the cantilever. The tip side coating enhances the conductivity of the tip and allows electrical contacts. The detector side coating enhances the reflectance of the laser beam by a factor of 2 and prevents light from interfering within the cantilever. The coating process is optimized for stress compensation and wear resistance. Wear at the tip can occur if operating in contact-, friction- or force modulation mode. As the coating is almost stress-free the bending of the cantilever due to stress is less than 2 degrees. Arrow™ is a trademark of NanoWorld AG. All data are subject to change without notice.